When creating a sign, one of the key factors to consider is the substrate. Substrate simply refers to the backing material your sign is manufactured from. At StopSignStore.com, we have three options for you to choose from. So which is right for you and your application? There are several factors to consider when choosing which substrate is right for your specific application, ranging from, strength, weight, cost effectiveness, life expectancy, and most importantly environmental. Will your sign end up in a landfill once it reaches its end of life, or can it be recycled? Flat Aluminum Sheets, made to the Department of Transportation .080" Standard thickness. This is the most common substrate for long term and permanent use that can stand up to harsh weather and it won’t bend or rust easily. It features a smooth surface, and is ideal for most parking, traffic, street, construction, school and re-useable real estate signs. Aluminum is very strong, rigid, and durable even though it is thin and lightweight, and can be recycled at many local facilities. It is without a doubt one of the most common substrates for high performance, long term use. Corrugated Plastic (also referred to by trade names Coroplast, Corex, Coro) is a low cost / weather resistant plastic manufactured to the industry standard of 0.125" thickness. This is the most common substrate for shorter term, promotional and temporary uses. You will often see Coroplast signs used for election candidates, lawn signs, special sales, directional signage, new building projects and even some shorter use real estate sings. It features a significantly lower cost that other types of rigid signs and it looks almost identical to a higher quality sign from a distance. They resist swelling, are extremely lightweight, won’t rust, rot, or mildew and best of all are 100% recyclable. If you are looking for an economical and lightweight double sided yard sign that has colors and graphics that do not bleed through and will last a couple of years, Coroplast might be for you. At StopSignStore.com we only use durable smooth signage grade 0.50" thickness plywood. We only use exterior grade plywood that has a moisture-proof and smooth surface. Plywood is perfect for construction site, billboards, subdivisions, real estate, and other double post outdoor sign applications. 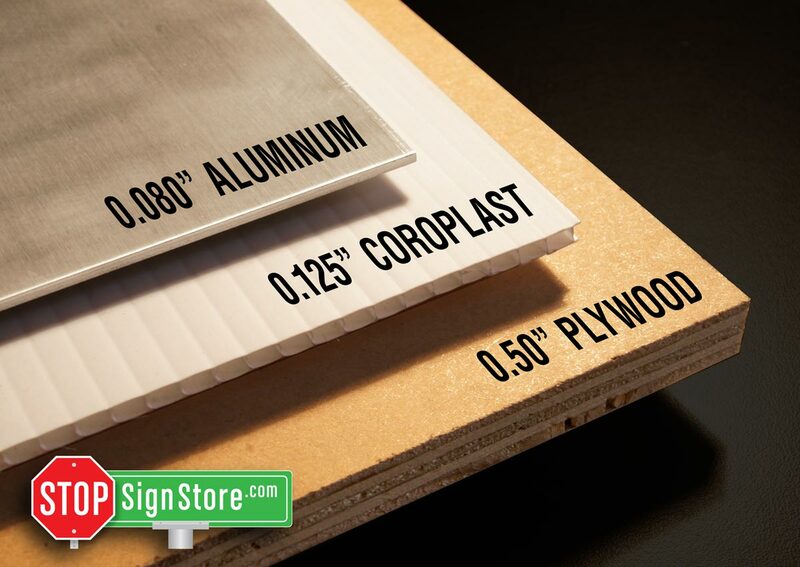 StopSignStore's 0.50” plywood thickness is very rigid and extremely strong. You can expect at least two year’s of longevity from our plywood outdoor signs. No matter what your application is, and with so many choices, at the StopSignStore.com we can help make the perfect sign for you. Just give us a call and one of our friendly and knowledgeable experts will help you make the right decision. No Left Turn Sign - 30" x 30"
No Left Turn Sign - 24" x 24"